Blog Columns Football Interviews England’s finest export? Who is the most successful English player currently playing abroad based on trophies won? Most people would undoubtably plump for Mr Beckham at this point but they would be wrong. Leytonstone’s finest has only won the La Liga title since leaving Manchester United despite the glory that always surrounds him. The Answer is Kenneth Steven Pavey. Who you may say, but I can assure you that Kenny is a true living and breathing legend in his surroundings and will be plying his trade in the Champions League come August time – yes a real Englishman in the Champions League (take note Arsenal!) when AIK Solna, Sweden’s double winners in 2008 take their place amongst Europe’s elite. So how did Pavey come to be plying his trade in a land best known for IKEA, Volvo and long, long summer nights. 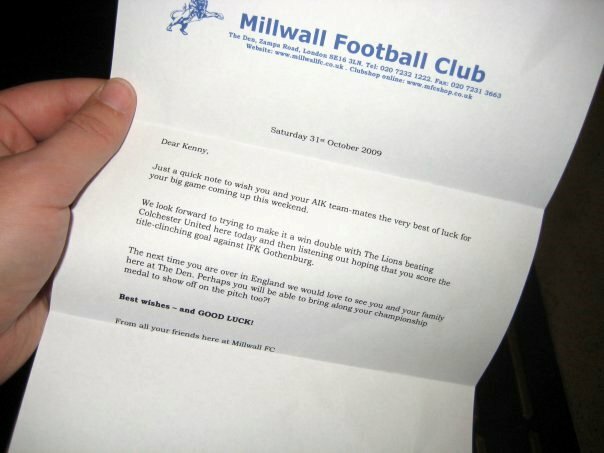 Pavey made his debut at his local club Affenley FC in South East London before moving to his boyhood favourite club Millwall FC as a schoolboy. Unfortunately the dream of playing for the Lions didn’t come through and so he moved down the A2 to Rymans League club Sittingbourne where he made his debut in one of the most progressive non-league clubs around. So progressive that he almost found himself on his way to Aston Villa where he seemed to have impressed when on trial in 1998 but the clubs could not agree on a fee and just a few seasons later he was catapulted into the world of Swedish second division football. Since that bold move he has integrated himself into the Swedish way of life, learning the language and throwing himself into his passion – football. He has won plaudits in and around the game for his attitude and his drive which last season saw him win the ultimate honour of a League and Cup winners medal. We caught up with Kenny just after he had seen his beloved Millwall beat Huddersfield Town to take their place at Wembley in the Play Off Final. I have to say that prior to my trip to AIK in April I had not come across your name in footballing circles, yet you are an almost household name out in Sweden. Does it annoy you in a way that your talents are not appreciated back in England? In some ways it does because I have achieved quite alot in my time out here. I have always wanted to play at a high standard in English football unfortunately that oppurtunity has not arisen yet. I feel like I am living a double life as when I am back home in England as no one knows who I am but here in Sweden it is completely the opposite. Based on the lack of English players playing for European sides now, I reckon you must be playing at the highest level of any “ex-pats” – does that give you some satisfaction? Absolutely, there are not many English players that have gone abroad and have had much success. I have to be proud with my achievements so far. Last month when we saw you against Halmstads, you slotted in at full back with ease. With the current dearth of decent English players in that position do you fancy your chances of a call up for England one day? Hahaha I am not expecting a call from Fabio Capello – in fact I doubt if he even knows who I am! I think my England days have past a long time ago but I must say like every Englishman, to represent my country would be a great honor. How did the move to Sweden originally come about? Basically I was close to signing for Aston Villa after I did well in a couple of trial games but the deal that fell through. However, the guy that scouted me for Villa also had a contact in Sweden called David Wilson who was playing in Sweden but also also working for Aston Villa. I was supposed to go on a week’s trial to Ljungskile but they wanted me to stay for a month as that was the longest time they could keep me as I was still under contract with Sittingbourne. After the month I came back to Kent, saw out my contract and then headed back over to Sweden – the rest you can say, is history. What went wrong in the prospective transfer to Aston Villa? Basically the way I heard it was that the two clubs could not agree terms. I had gone to Villa for a week’s trial and things could not have gone better. I played a full match against Coventry City reserves where I scored in a 2-1 defeat and everything looked good until few days later when I looked at the local paper, the Kent Gazette, where the headline read ‘Villa dream falls through for Pavey’. It was the first time I heard about the deal falling through and this was not a very nice way to find out. I took it quite hard, but I am big enough to know that these things happen in life and I had to just dust myself down and carry on trying. You played at Sittingbourne during their “glory years”, was there a feeling the club could go further at the time? It was a bit of a crazy club to be at, at that time. It had an amazing stadium, a YTS programme and had alot of ex-pros playing and involved in the club. They were good times but unfortunatley the business side of things went wrong and they couldn’t keep or pay the players. Consequently we lost the stadium and the club has never really hit them heights again, but the club had potential and its a shame it didn’t live up to its expectations. Millwall have had a very good season themselves in what is arguably the toughest ever League One. How do you think they will fair next season? Did you manage to get to any games at the New Den during the Swedish close season? I had a great feeling about this year in the summer and as the year has progress it has turned out into a fantastic season and everyone is very proud of the team. I was invited down by the club with my family for the match against Wallsall in December and did some interviews and went on the pitch which was a great moment for me as a Millwall fan. The club also sent me a good luck letter before the vital last match of the season against IFK in October which was very special and underlines their caring family nature. I feel that if we can keep certain players and stengthen the team in some areas we are more than capable of mixing it with the best in the Championship. This is our year!! ”Come on ‘wall” . We’ve recently researched an article about the AIK fan groups. How much of an eye opener was it to see them in full flow in a Stockholm derby game? For me it was one of the best football experience of my life, my first derby match was a crowd of just under 35,000. Its normally night games and the fans make it an amazing experience with Tifos, fireworks and flags. We won 3-1 that night which made the experience even more special. Family and friends that have been over say they have never seen anything like it, it makes me very proud of the fans we have here. The fan groups I have spoken to speak very highly of you. Why do you think they have taken to your style so much? I am not too sure really. I have always appreciated the fans here and they have always been great to me. I chip in with the odd goal and assists but I think it is my attitude on the pitch that makes them like me. Did you manage to get back to England for the Lions Play Off Final at Wembley? Unfortunately not. It was the only week off we had all summer so I had arranged to take the family away on hoilday to Rhodes. As you can imagine I was gutted! I tried to swing the Mrs around to the benefits of a weekend in Bermondsey but she was having none of it as we havent been away for two years so I was hoping for an ash cloud over Greece haha! No team from Sweden has been able to “dominate” domestic football for over a decade. Do you think AIK are positioned to start on something special? Our success last year was amazing. It was the first time AIK have ever won the double and then we went on to win the Super Cup which made it a very unique triple beating IFK on all three occasions. Unfortunately sometimes with success teams break up, players move on, so our team has been reshuffled. If we could have kept all our players we would have dominated this season I think, as well as bringing in some of our youth and some players from outside. So far it has not looked like the success of last year will be repeated this year, but we still have a long way to go and of course an European Adventure to look forward to. Was the success of the team last season a surprise? It has been a few seasons that a team has won the double. Was it more satisfying to beat IFK twice in a week to get the double? No one had us down at the beginning of the season to challenge for the title. We are always up there or there abouts, but to win the league the way we did will go down in history. It was a very exiting year for Swedish football. We had to go Gothenburg on the last game of the season and get a draw. They had not lost at home all year and a win for them would have won them the league. We went one down before half time but managed to turn it around and win 2-1 to win the league. A week later we played them again in the Swedish Cup final where we won 2-0. For me just winning the double was amazing, beating Gothenburg just made it even more special because how close we both were all season. What did you think about your “award” last season? Are you talking about the award from the fans for voting me the best right midfielder in ten years or the award from Sweden’s version of Sky Sports “Canal +”, where they asked all the players in the league who they thought was the dirtiest player. Haha! I feel I play hard but fair, and some people don’t like it, but it was more for my aggressive style than for the amount of cards I received. It didn’t bother me really – just made things even harder with the refs out here! How intrusive are the media in Stockholm? Can you go and enjoy a beer without any problems? AIK are the biggest team in Sweden so there is alot of media attention on us but its mainly the football side of things and not your personal life like in England. When we go out you get people coming up to you and stuff but it’s all in good nature and it’s normally just to say hi or have a picture. As someone who lives most of the week in Copenhagen, and works for an English company where everyone speaks English. Is it the same at the training ground? Så hur bra är din Svenska? Its a mixture of languages but the main language is Swedish although we have a few Brazilians so a translater is needed. My Swedish is pretty good now and feel confident in doing most interviews in Swedish. The Swedish people here speak great English so it’s easy to speak English with them, plus they seem to like it, but I try and speak as much as I can depending in the environment. I found the hardest thing to get used to is the bikes (and the ridiculous price of beer). What things have you found difficult to adjust to? The most difficult thing was living on my own in the beginning – I was 18 and I’d never lived on my own before and starting in a foreign country in a small town was tough. I now live in Stockholm and I have pretty much everything here although a pie and mash shop and a KFC would be more than welcome! What has been your highlight in playing in Sweden so far? I won the Division 2 (Superetten) twice with my previous club Ljungskile, but obviously winning the triple with AIK has to be the biggest highlight in my career, let alone in my time in Sweden. I scored the winning goal in the last game of the season to win the league for Ljungskile which will stay in my memory for a long time, but last year I scored an important goal for AIK in a derby match which we needed to win where I had been on the pitch for less than two minutes after coming on as sub and with the scores level. I scored with my second touch and I went mad, jumping up at the fence to our fans – I cut my hand on the spikes which further endeared me to them. The celebration caused a bit of controversy as it was discussed on Good Morning TV where I was accused by a pundit of provoking opposing fans which was a load of rubbish! What is your favourite area of Stockholm? Gamla Stan – a lovely old town with alot of history and character and English and Irish pubs. Just how cold does it get when you have to play away in places like Sundsvall in the Autumn? I have played in some really cold temperatures but the game is normally indoors, although the cold doesnt really bother me that much but the long three month pre season in the Winter can be tough. A night out in Faversham or one in Ljungskile? There are not many places to go out in Ljungskile so I’d have to say Faversham. Come on then – ideal Champions League group draw next season (assuming you make it through the qualifying) – as a Millwall fan there must be part of you wants to play Chelsea? Last time AIK got to the Group Stages they had Arsenal, Fiorentina and Barcelona and played the Gooners at Wembley. Change Arsenal with Chelsea and that would do me just fine! So there we have it – an insider’s view of England’s finest current footballing export and a jolly decent chap to boot. If you fancy watching Kenny in action then get yourself over to Stockholm, jump on the T-Bana and head North a few stops to Solna and watch a game at the Rasunda, the national stadium. I am sure he will even buy you a pint! We will check back in with Kenny later in the season to see how the second half has gone. Donovan May Prosper, but Dempsey More Deserving? ONE KENNY PAVEY, THERE’S ONLY ONE KENNY PAVEY, ONE KENNY PAVEY! !